Want to get rid of your reading glasses? Maybe, now you can. As we age, starting around the age of 40, the natural lens inside the eye begins to lose its flexibility. This reduces the eye’s ability to change its focus from near to intermediate, to distance, and back again. This is known as presbyopia, and the first symptom is frequently trouble seeing things close up. Bifocal or trifocal glasses often become essential for most people to see clearly at all distances. As the natural lens of the eye continues to deteriorate, it starts to become cloudy or brown due to the cataract developing. Eventually, vision becomes impaired, and colors appear faded. The only way to see clearly after a cataract matures is to have it removed and then replaced with an intraocular lens, or IOL. The IOL most surgeons use in cataract surgery is the monofocal IOL, which leaves the patient at a disadvantage for near or mid vision. Often times with the monofocal IOL, patients will still need to wear eyeglasses. About 4 million cataract surgeries are performed every year, and the annual number is expected to grow in coming years. More than half of Americans have had a cataract by the age of 80. However, cataracts can also affect younger patients, as it is estimated that a quarter of all cataract surgeries will be on patients younger than 65. The recent FDA approval of the TECNIS Symfony Intraocular Lens (IOL) is great news for people with cataracts and presbyopia. The Symfony lens is the first extended range of vision IOL designed to correct presbyopia and improve vision in people with cataracts, by improving far, intermediate and near vision. This can result in a decreased need for glasses or contact lenses after cataract surgery. 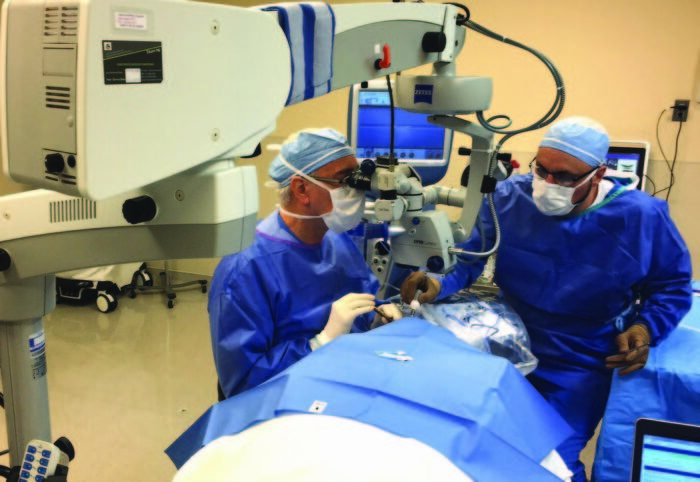 Dr. Allen Zieker, President and Director of Cataract Surgery at Ophthalmic Consultants of the Capital Region, is one of the first ophthalmologists in the United States to implant the new Symfony IOL. If you have been told by your eye doctor that you have cataracts, you may be a candidate for the TECNIS Symfony IOL.